Welcome to the Many Marvelous Markers Club Information Page. You'll find all the details about the Many Marvelous Markers club here plus an application form to join the club. - so gather together some friends who also really want this fantastic, versatile set of markers and we'll be ready to start. - you do not have to get 8 people as I will join all the applicants into groups, but obviously the sooner the group is full, the sooner we get started. What does it cost to belong to the Markers club? The cost is just $40.00 per month for 8 months. What do I get for my $40.00 each month? Do I receive any additional gifts? 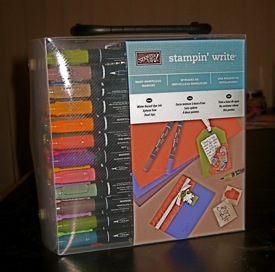 Can you give me some technical information on the Stampin Write Markers? Store them horizontally - the carry case is perfect for doing this neatly. The markers have tips on both ends - one is a brush tip, the other is a 0.5 mm fine tip perfect for journaling, creating faux stitching in co-ordinating colours or colouring detailed areas. The markers contain the same water based ink you get in your Classic Stamp Pads - ensuring perfect colour co-ordination with stamped images and card stock. The markers are odourless and suitable for use in enclosed areas. The markers come in a pack of 48. That is 12 in each colour family - Bold Brights, Earth Elements, Rich Regals and Soft Subtles. Fill out the form below and submit it by following the instructions. You will receive an automated confirmation email from me then I will contact you by phone for payment details. Pass this information on to friends who might be interested in joining. Please provide some additional information by selecting one or more of the following statements. I forwarded this information to my friends. My friends are interested in joining the Marker Club.